When I first wrote up Pat Nevin in November 2007, I knew almost nothing about him. I knew he was an Irish artist, widely travelled in Ireland, England and Europe, who produced painting, illustrations, posters and comic strips. To comics fans he is best known as the artist on 'Captain Starling', the George Beardmore-scripted strip in Girl (1951). He had earlier produced illustrations for Eagle (1950-51) and his work can be found in Eagle Annual, Girl Annual and Swift Annual. Unfortunately, a search of the web for information turned up very little—and most of that concerning Patrick Kevin Francis Michael 'Pat' Nevin, (1963- ), the Scottish footballer, or Louis Pat Nevin (1907-1998), the Irish-Canadian author of Ireland: Where Time Stands Still (1973) and Ireland: Where Our Roots Run Deep (1987). Now, thanks to Pat's daughter Fiona, I can present a rather fuller picture of Pat Nevin, also known to many as Paddy Nevin. Paddy was born near the town of Ballymena in Northern Ireland on 17 March 1912 and was christened Frederic Walter Nevin. He was the sixth of seven children and his talent for drawing was noticed at an early age. By the age of three he was drawing soldiers and battle scenes that he copied from the newspapers. His father, Francis (an exporter of Irish cloth) encouraged him and made sure that he supplies of everything he needed for drawing but died tragically young when his son was only 8. In 1929, at the age of 16, he enrolled at Art School and spent three happy years studying art. When the Tourist Trophy races came to the roads around Newtonards his lifelong interest in motor racing began. He met Malcolm Campbell and drew his blue Bugatti and became a familiar figure around the pits, recognised for his fast and accurate sketches of the cars, their drivers and mechanics. 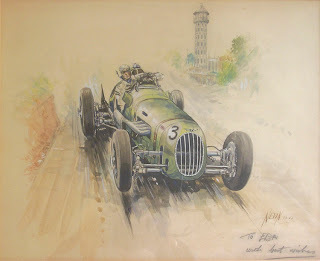 His oil paintings of the heroic battles between Mercedes-Benz and Auto Union attracted a lot of interest. In 1936, Nevin decided to try for a job in the film industry in England and moved to London. 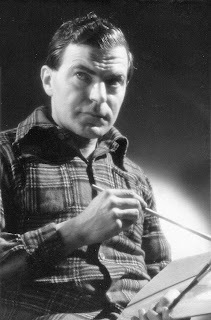 He found work in nearby Elstree Studios as a set designer and was involved in Fire Over England (1937), with Flora Robson as Queen Elizabeth I, and The Lady Vanishes (1938), the famous Hitchcock movie with Margaret Lockwood. 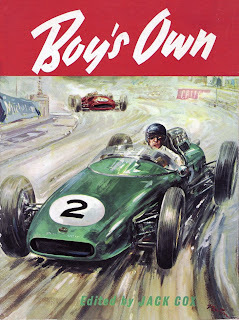 In 1937, he landed a job with The Motor magazine as their motor racing artist. His first job wa to cover the Le Mans 24 hour race and his drawings were flown to England in time for the magazine's deadline. Nevin cover all the major Grand Prix and sports car races of the day, including events at Brooklands and Donnington. His career was curtailed by the war. Nevin joined the RAF and was involved in Special Duties, working as a photographic interpreter in England and North Africa. After being demobbed, Nevin settled in Pinner, Middlesex, with his wife, Angela, and became a freelance commercial artist. In his garden studio he created cover artwork and illustrations for many publications over the years; in addition ot the titles mentioned above he also contributed to Boy's Own Paper, TV Comic, Pippin and educational books. In the 1950s, he was commissioned to paint several British Railways posters for Scarborough, Jersey, Brittany, Ulster and the South of France. He also painted posters for the Cunard Shipping Line. "As a freelance artist, my father was constantly working into the night in order to meet a publisher's deadline," recalls his daughter, Fiona. "Smoking 40 Woodbines a day, on cold winter nights he would come into the house frozen with paint brush marks all over his face. Sometimes I was lucky enough to accompany him the next day to central London to deliver his work to the publication offices, which was always very exciting. If I could get a day off school as well I was ecstatic! A lot of his work in this field was not signed or credited to him. 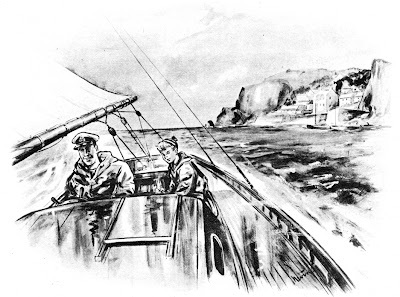 The original artwork was kept by the publisher. "In later life my father retired from commercial art and painted seascapes and landscapes. He recreated the pre-war motor races he loved so much from old sketches and from his excellent memory. He enjoyed late celebrity when he was in his seventies and was featured in Classic Car magazine on several occasions. he was invited to the Brooklands race track and museum and donated a painting for their permanent exhibition." Pat Nevin died at his home in Pinner on 25 April 1995, his death registered at Harrow under the name Frederick Patrick Nevin; his early paintings were credited to F. P. Nevin. After his death at the age of 83, an art gallery building in north London was named Nevin House in his honour. Fiona is still discovering new work by her father; as she told me recently, "My father kept very few examples of his work." For Pippin he worked on many television favourites, including Bizzy Lizzy, Camberwick Green, Ivor the Engine, The Pogles and The Herbs. "I am certain that he worked on The Woodentops as I have a photo of one of the comic strips," says Fiona. "Also that he worked on the Pogles—I have somewhere a letter from Oliver Postgate in which he discusses how he would like my father to draw his characters. "These later strips were my father's bread and butter work—he did, I believe, struggle with some of them as he was not given as much freedom. He naturally was inclined to the subject matter of his earlier work—cowboys, adventure, secret service, motor racing, etc.—and his heyday was in the '50s and early '60s." Smiley Roams the Road by Moore Raymond. London, Hulton Press, 1959. A Book of Boys' Stories by Robert Moyes Carruthers & Nicholas Marrat. London, Golden Pleasure Books, 1964. Cowboys and Indians. 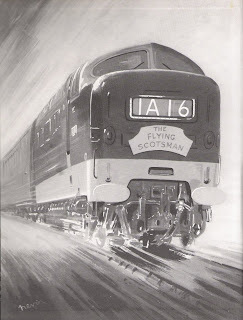 London & Edinburgh, Thomas Nelson & Sons, 1964. My First Geography Story Book by Jane Clarke. London & Edinburgh, Thomas Nelson & Sons, 1964. My First History Book by John Kennett. London & Edinburgh, Thomas Nelson & Sons, 1965. The Reluctant Nurse by Elisabeth Sheppard Jones. London, Golden Pleasure Books, 1965. My First Book of Kings and Queens. London & Edinburgh, Thomas Nelson & Sons, 1966. Don Grant, whose father Gregor edited Autosport magazine in the 1950s and 1960s, has sent over the above watercolour painting by Pat Nevin. The car shown is the 1939 Imperial Trophy race winning Alta driven by George Abacassis and the painting is dedicated to Eba, Don's mother. Yes Pat Nevin(my father) was also F.P.Nevin, Paddy Nevin amongst various names! He was born in Norther ireland and came to England after attending Dublin School of Art. He found work in the film industry and worked on set designs for a number of British films in the 1930s. He worked for the Motor magazine as a motor artist for several years. He produced some outstanding art which is now very collectable.He settled in Pinner, Middx after the war with his wife Angela and 2 children. Working from his studio he produced many illustrations and comic strips. Almost too many to mention. They included Boys Own Annuals and Pippin later on as well as the publications mentioned. I am very proud of him needless to say! Many thanks for getting in touch and for the additional information. Perhaps you could drop me a line directly (my e-mail address is at the top right under the pic) and we can put together a more substantial piece about your father's career. Hi Steve. Yet again, some fascinating biographical notes on these bygone and often unheralded artists. I can add at least one definite credit to Nevin's CV - this was the (one and only) annual dedicated to the kids adventure TV series ORLANDO (starring Sam Kydd as a loveably rogueish old salt). The annual was published for Christmas 1967 by TV Publications, the publishing arm of London weekday ITV contractor Rediffusion. This annual is clearly credited 'Stories and Scripts by Roger N. Cook' and 'Illustrations by Patrick Nevin'. Most of the book is text stories, with broadbrush ink work by Nevin, with colour swatches presumably added afterwards. There are two colour picture strips though. The first I guess is by Nevin, in a painted style but the second is by a different (uncredited) artist - I'd stick my neck out and say this excellent work is by sometime TV21 artist Don Harley? I detect Nevin's work in a one-off TV-related annual TV CRIMEBUSTERS. 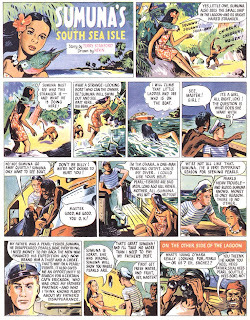 Published by TV Publications in 1962, this super effort features strips on many ITV, BBC and American crime shows of the day in strips and text stories. Most of the strips are influenced by the Italian fumetti/fotoromanzi style, with occasional photos mixed in with the art. 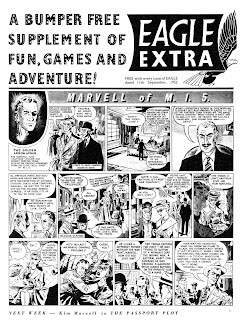 Series featured include Danger Man, The Four Just Men, Dixon of Dock Green (a strip attributed to one GS Marler), Charlie Chan and, most famously, the very first picture strip based on the first season of The Avengers. Starring Patrick Macnee and original sidekick Ian Hendry (their only outing in strip form) I would with reasonable confidence attribute this strip to one Patrick Nevin. Anyone know if this was indeed a one-off - could there have been a summer special or something at any point? A really high number of top notch spin-offs which must have cost a small fortune in licensing deals! Danger Man comics and annuals appeared of course, many later incarnations of the Avengers were adapted into comics and Dixon was a regular strip in Swift but for several series here I think this would mark their only British comic outing. As a motoring enthusiast living in Belfast with connections to the various commemorative events for the Ards TT Races I consider myself very fortunate to have been able to buy a Nevin charcoal and wash drawing of Ulster driver Hugh Hamilton's extended pitstop in the 1933 TT that allowed Nuvolari to take the lead. I bought it about ten years ago from a dealer at the Goodwood Festival and it is something I treasure greatly. A friend has a smaller sketch of a Riley in another TT race. Hi Steve. I hope you don't mind, but I've written a piece on Pat Nevin for the Irish Comics Wiki, which is basically an abridgement of your excellent piece. Thanks very much for drawing him to my attention. I am a great niece of F.P Nevin. I grew up hearing of him from my Grandmother, his sister Ethel in America. It was so fun to find this infor on him. Thank you. Pleasure. Most of the information comes from Fiona (Pat's daughter) and I'm just happy to be able to present it here. It's great to hear from relatives of artists whose work has been largely forgotten -- Bear Alley is proof that it hasn't been completely forgotten and the enthusiastic support of readers and relatives is what keeps it going. I have a watercolour (Houses by a river? ')and an oil painting (beach and seascape) by Pat Nevin. I helped clear the house for a friend of mine whose brother had died. He lived in Pinner and was a neighbour of Pat. He had the paintings and my friend gave them to me. They are very lovely and very high quality paintings. I never met Pat, but I use to do odd jobs for his wife Angela. She must have got my name from the DIYshopin Pinner Green Pinner, she would call me to come to her house and mend somthing or other of do some woodwork for her, and we would always end up havind a bowl of her home made soup or a cup of tea, an dshe would tell me all about Pat and his art, it was all so fasinating to me as I once was a silk screen printed and worked with a lot of artists. I always would admire the drawing that hung in her kitchen of a cowboy on a bucking horse, and she would show me all his paintings in the house, so she became a friend and as I knew she was lonly I would call on her every now and again for a chat and just to see if she was O.K. She would call me and onced asked me if i knew someone that could come and change a sticky light bulb for her and I said yes I would send him around and then go to do it for her and she would always offer me some money but unless it was a big jog I would always refuse it, and we then would spend ages just talking about Pat and she told me how she met min in Regents Park Open air Theater on soon married him. On one occasion she said I know how much you like Pat's pictures so if you go upstairs I have layed out his pictures and you can pick one, But I said that I did not want to as I felt that I may look as if I had talked her into it,but she said look they are mine and if I want to give you one of Pats pictures I can so off you go, So I reluctantly did pick one and it hangs in our lounge and it always remindes me of my visits to Angelas house and the houres that we spent talking about her and Pat's life, me and my partener became friends of Angela's and use to exchange christmas cards. Then sadly one day I had a call from Angalas daughter to say that she had died, we went to her furenral and then back to her house were her daughter's kindly gave us another of Pat' pictures and now it hangs in our bedroom. So I have some very happy memorys of Angela and her story's of Pat. Mr father was in the RAF with Pat during the war, and I have an illustration of ERA and maybe Alfa racing elbow-to-elbow dated 1941. It's excellent and I would post a photo of it if I knew how! My father told me that Pat drew it in a few minutes while he watched, and then simply gave it to him. Generous guy. I am very pleased to have found this site; I knew Paddy a little and found him a fascinating man. He had a wonderful sense of humour. I bought many of his pictures and he joked that I had paid for the new double glazing of his house. The man who framed the paintings for me reckined they were of museum quality; he had one himself of Lyme Regis which he refused to sell to me, despite my best efforts. There was a seascape on the wall of the house in Pinner which I would have loved to own but Paddy would not part with it...even to his best customer. Where is it now I wonder? I got to know Paddy in the late 80's when he was invited to speak at a Singer Car Club dinner - he famously drew two Singers crashing at the same place in the 1935 Ards TT - in fact the second car nearly landed on him when he was sketching the first! Living just a few miles away, I spent many evenings in his company - fascinated by his stories and wishing I could afford to buy some of his work - a blue Delage racing in wet weather was a favorite.. - but I was too busy paying a mortgage and restoring my Singer LeMans. Having helped him 'recover' some paintings from an art dealer in Norfolk, I took him to meet Kevin Wheatcroft at Donnington who bought a painting of Mercedes and Auto-Union battling it out through Starkeys Bridge for his father, Tom Wheatcroft. After that, he painted and gave me my own example of the Singer team cars at the 1935 Ards TT together with one of Betty Haig competing in a sister car to the one I own. They still hang over my desk almost twenty years later and I still love looking at them. Other things I remember? "Baby needs new shoes" would be what he said when he needed to sell a painting to raise some cash. He still had some photographs from his days with the RAF at Hughenden Manor working with Churchill's daughter. He was a lovely man and it was a joy to find this site. I hope all the paintings in his spare room found appreciative homes! Hi, i also have fond memories of Paddy and his wife Angela, they used to visit the launderette in Pinner quite often and i always enjoyed talking to them both. Paddy always had a story to tell and Angela had a wicked sense of humour. After Paddy died Angela gave me a painting of Paddys, it was of a garage, McGympsies, i believe it was a garage near to where Paddy grew up. Angela also showed me lots more of his paintings, a very talanted and gifted man, and i feel honoured to have known them both. "Enough to give one brain fever..."